Timişoara (German: Temeswar; Hungarian: Temesvá; Serbian, Croatian:Temišvar) is the demographic, economic, religious and cultural capitals of Banat. It is a multi-ethnic city with a Romanian-speaking majority and a point of attraction for many migrants from within the country and abroad. Timişoara was first documented in 1212 as ”Castrum Temensiensis” in royal Hungarian records. The city was built into drained moorland. Thus, it was not clear in the beginning upon which river the city would lie due to the many different stream courses. The city name literally means castle upon the Timiş. It became only clear in the 18th century, when all the moors had been drained and the land had been fructified, that Timiş River did not run through Timişoara but Bega River did. The old city of Timişoara was built by Prince Eugene of Savoy after the end of the Ottoman Rule on October 18th 1716. Many of the district names refer to their original usage, such as Mehala (Turkish for suburbia) or the fabric district in which many manufactures could be found. Other districts and houses were named after Habsburgs, such as the former “Meierhöfe” (administrative buildings) named after Empress Elizabeth (Sissi). In the Meierhöfe, the supplies for the city were organised. Timişoara likes to call itself “Little Vienna” and “City of Parks and Roses”. The latter is due to the Mühle family, a family of gardeners who turned Timişoara into a green and flourishing city in the 19th and 20th century. The Bega channel used to be of great importance for the city, since it enabled access to the Danube (via Tisza River) and thus benefited the wheat trade with middle Europe. This elaborate transportation system on the Timiş-Bega channel earned Banat the name of the “monarchy’s granary” and contributed to the city’s wealth. A 2002 census showed that the majority of Timişoara’s 317.660 inhabitants are Romanians. Only 2,5 percent of the population are Germans. 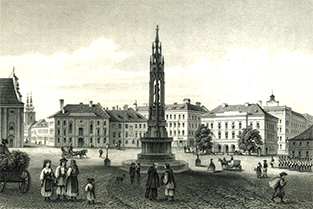 Timişoara in the 19th century. 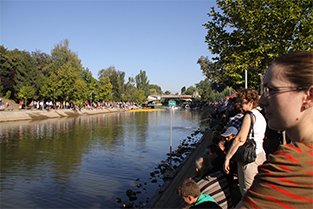 Bega River running through Timişoara. The channel was built in the 18th century and was used as a shipping route until the 1950s.